My Genomestory :: What is My Genomestory? Your DNA can help you to discover information about yourself on some of the most fundamental levels, such as the kinds of diseases you might be vulnerable to, whether you will experience hair loss or not, and what kind of diet might be important for your health considerations. If you experience anxiety or struggle with an illness, please let us know. 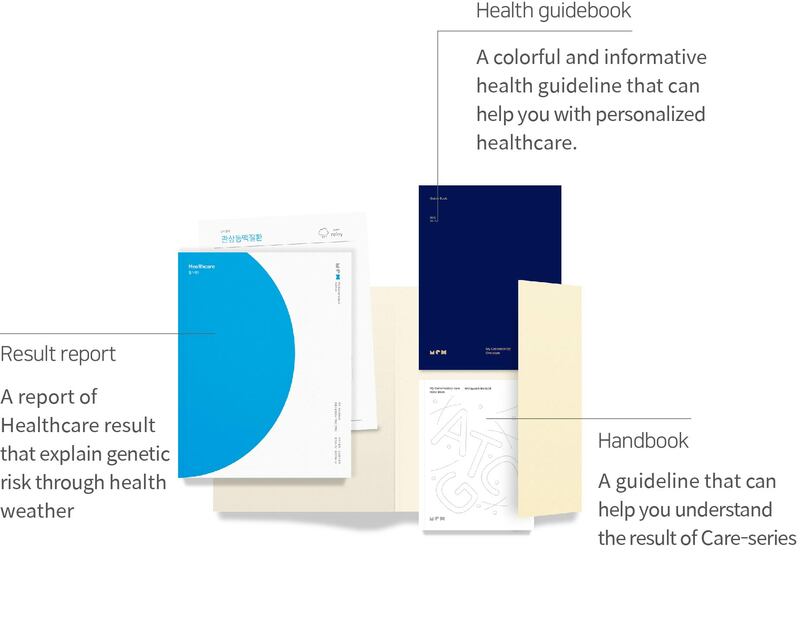 My Genomestory will help you to learn more about your health. We carefully prepare your unique genetic results into a single special package. What is the competitiveness of My Genomestory? We provide Asian-specific test results based on the standard genome constructed through the analysis of 100,000 Asian people. We provide analysis results by analyzing as many single nucleotide polymorphisms (SNPs) as possible to increase predictability. We update analysis markers (SNPs) to improve predictive ability and use up-to-date prevalence data to provide the most recent contents while increasing the reliability of the analysis. We offer customized healthcare solutions that can be practiced in everyday life based on the results of genetic testing. It’s an uphill battle to try to go up against a long list of diseases. We can try our best by checking up on our health regularly, but most of us can’t help but feel uncertain, even under situations where we have not found any signs of illness from our health check-ups. Your genes do not determine the exact diseases that you will suffer. Rather, they help to inform you about your personal vulnerability to the different types of diseases. By identifying health risks earlier on, you’ll be able to make necessary adjustments in your life, in order to prevent an early onset of unwanted symptoms or illnesses. Nevertheless, these “secrets” rarely yield any concrete results. What we need is not another trendy dieting technique. What we need is sustainable customized management of our diet. Your genetic analysis won’t act as the next trendy dieting secret. Instead, it can help to guide you towards a dieting plan that you can help you in the long-run. Collect your DNA with our easy-to-use saliva kit. You can check the analysis results within 2~3 weeks after the sample arrives.